By now you’re on board with this story or you’re not. Everything about the latest interstitial from middle earth feels like a middle, an entertaining if thinly plotted hero’s journey between the last Hobbit movie and the next. On HFR and 3D: It’s true what they say, high frame rate (HFR), or 48 frames per second, really does make it look like video, and does, despite all the effort and expense, feel cheaper somehow. Is this purely by past association with 50 or 60 frames per second PAL or NTSC television? A longer, better examination of the subject than this writer can provide may be found here. 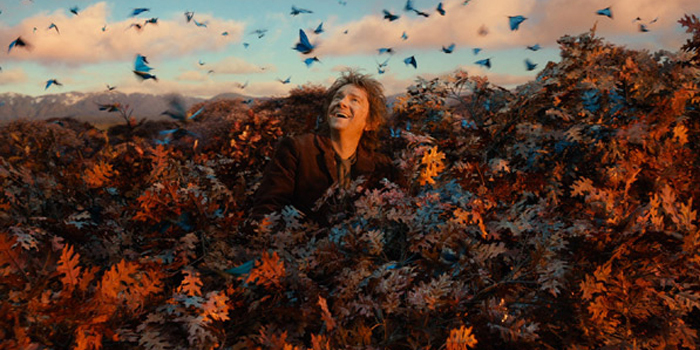 HFR does help stabilise the fast paced action, of which Smaug has plenty. Action and 3D however remain a non-optimal combination because refocussing for depth slows down the viewers ability to absorb hyperactive imagery. Nevertheless, the imperatives of cinematic spectacle continue to drive the two together.